It was smiles all round for two Cambridgeshire ACF Cadet Force Adult Volunteers when they were presented with their 2nd Lieutenants “pips” on Monday evening at the Cadet Training Centre, Waterbeach. Pictured - Colonel Mark Knight MBE, Commandant presented 2 Lt. Liam Burch and 2 Lt. Tom Knights with their rank slides witnessed by Major James Wood, IC Officer Training. Both recently attended the Officer Selection Centre at Westbury over a weekend of assessment. Upon successful completion they were awarded the Cadet Force Commission with the rank of 2nd Lt.
All does not end there as they are required to undertake further Initial Office Training ( IOT) over the next twelve months involving two weekend courses at the Royal Military Academy, Sandhurst. The build up to this involved two separate days training organised by Major Wood followed by a Pre-CFCB selection weekend at RAF Wyton. Both Liam and Tom are Detachment Commanders at Waterbeach and Sawston respectively. Liam joined Cambridgeshire Army Cadet force at the age of 13, he joined Cherry Hinton detachment before he moved to Newmarket detachment a year later. Liam stayed at Newmarket detachment until he aged out at the age of 18 years and 9 months. Whilst he was in cadets Liam was in the Corps of Drums where he had the opportunity to go to the Military Tattoo in Malta. Liam reached the rank of company Sergeant Major before leaving. Liam left cadets and decided to join back up as an adult almost straight away. He joined Newmarket as an instructor. Liam said he would never do shooting again as an instructor, however now he finds himself on the ranges most of the time. He has gained plenty of qualifications whilst in the cadets and enjoys helping and supporting the county shooting officer. In his own time Liam runs his own Plumbing and Heating company, which keeps him busy, however he commits himself to the cadets as he wants to help cadets gain the confidence and have the experiences he did. 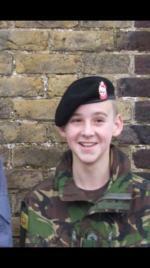 Photo is of Liam when he first joined the cadets at the age of 13. 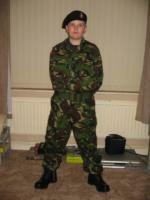 Tom joined the Army Cadet Force (ACF) at the age of 12 and paraded at Deal detachment in Kent. He remained in Kent ACF, working his way up to a cadet Staff sergeant, until he relocated to Cambridgeshire at the age of 17 where he joined Ely detachment. He continued to work through the cadet rank structure until he became Cambridgeshire ACF’s most senior cadet by obtaining the cadet Regimental Sergeant Major (RSM). Tom left the ACF aged 18 and 9 months before rejoining as a Cadet Force Adult Volunteer (CFAV) 6 months later. He realised in his time away that being a part of the ACF was important to him as he had gained lots of knowledge which he knew should be passed on. Tom rejoined Ely detachment before moving to Waterbeach detachment, Soham Detachment and most recently becoming the Detachment Commander (DC) of Sawston Detachment. First aid was one of Tom’s most important subjects within the ACF and because of this he developed his knowledge so that he could teach First aid to younger cadets. He was also part of the County’s first aid team where he helped lead the team to win the National first aid competition. His subject knowledge is not just limited to first aid, he has become a skill at arms instructor with a passion for drill and adventurous training. Alongside his role as DC Sawston he is also 3 Company’s adventurous training officer with his mobile climbing tower and obstacle course supervisor qualifications. In his day job Tom is an Emergency Medical Technician for the East of England Ambulance Service. He is also studying part time at university of which he hope to finish in October to become a fully qualified paramedic. Tom says “Becoming an officer with the ACF has taught me greatly. Most importantly you should be yourself because you already have the right qualities, you just need to develop them” Photograph of Tom as a cadet at the age of 13.